A probing chronicle of the mass ethnic slaughter in Rwanda that raises questions about human survival and coexistence in that country and everywhere. In a period of 100 days during 1994, at least 800,000 Rwandans died in government-sanctioned mass killings. The government, dominated by Rwanda’s Hutu majority group, decided that it was necessary to rid the country of its Tutsi minority and called on its Hutu citizens to carry out this collective charge. Further slaughter ensued in a horrific aftermath, when victims and perpetrators found themselves together in Zairian refugee camps. 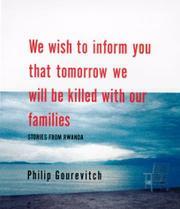 Gourevitch, a regular writer for the New Yorker, responded to the Rwandan massacres both professionally and personally. As a child of Holocaust survivors, he felt himself relentlessly drawn to a country where T-shirts read “Genocide. Bury the dead, not the truth.— The result of Gourevitch’s repeated trips to Rwanda during and after the massacres is a book that is less a history lesson (though it is that, too) than a series of meditative essays on the deeper meanings of the Rwandan genocide. Gourevitch deftly weaves together historical background to the massacres (arguing against the oft-invoked theory of ancient rivalries), firsthand accounts of the killings, stories of survival and loss related by a handful of Rwandans, and cynical criticism of international agencies— handling of the situation. Without invoking Bosnia or multiethnic societies worldwide, Gourevitch shapes his discussion of Rwanda into a broader inquiry into human psychology and collective identity (“Genocide, after all, is an exercise in community building”). Despite the cruelty and injustice of the situation he describes, Gourevitch remains an optimist, closing with the courageous example of Hutu and Tutsi girls under attack who risked their lives by refusing to separate themselves by ethnicity. Gourevitch’s first book should be required reading for those seeking a better understanding of Rwanda’s massacres; it’s also a thoughtful investigation of ethnic conflict and its aftermath.